The Pier Arts Centre offers many opportunities for involvement and participation in the visual arts and crafts both within the gallery and beyond. Workshops for younger children (5-11 years old) take place throughout the year: Leading Lights workshops take place at regular intervals during term time and focus on aspects of the Collection and temporary exhibition programme. During the Easter and October holidays a week of art and craft activity workshops take place in the gallery. 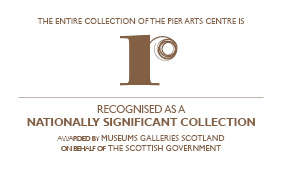 Through its outreach programme and its partnerships with local organisations such as Stromness Shopping Week, Orkney Folk Festival, St Magnus International Festival, George Mackay Brown Writing Fellowship, Soulisquoy Printmakers, and Orkney International Science Festival, the Pier Arts Centre presents a year round programme of events. Each day throughout the school holidays we will have a selection of art and craft activities available to collect from our reception area.